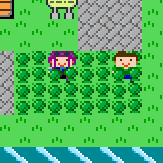 I have changed the grass overlay so it is an extra layer on top of the background tiles. Before this, a sprite was continuously being updated to the position of a character. Both approaches worked, but the latter increased the number of calculations per frame, so it might decrease performance when a lot of characters are present. In the screenshot below you can also see another update: different sprites for NPCs.